Identfiy the building. 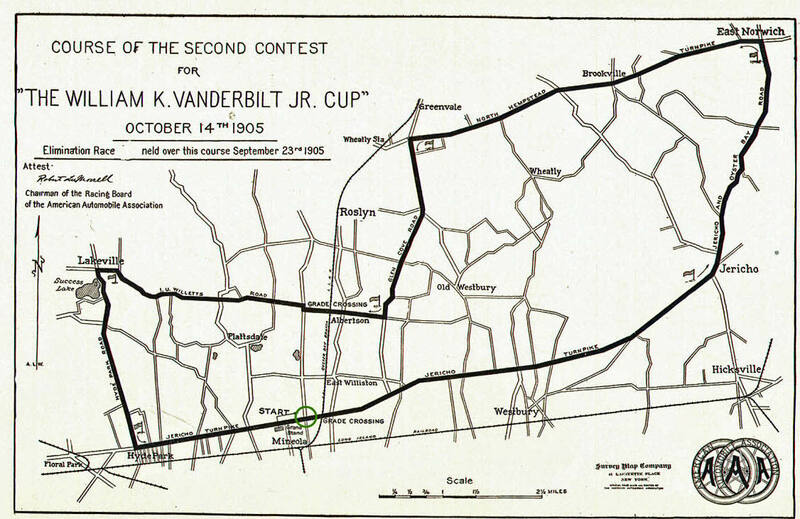 When was it on the course for the Vanderbilt Cup Races? Krug's Hotel, on the north-west corner of Jericho Turnpike and Willis Avenue in Mineola. The hotel was a favorite viewing site for the 1904, 1905 and 1906 Vanderbilt Cup Races. What is the orientation of the photo? Looking north-east. Likely taken from a building on the south side of Jericho Turnpike. What is the approximate year of the photo? Provide a rationale. The caption reads "Krug's Corner" circa 1915. However, as noted below by Ed, the license plates indicate the photo was taken in 1912. Congrats to Joseph Oesterle, Tim Ivers, Greg O., Steve Lucas, Art Kleiner, Chuck Rudy and Frank Femenias. 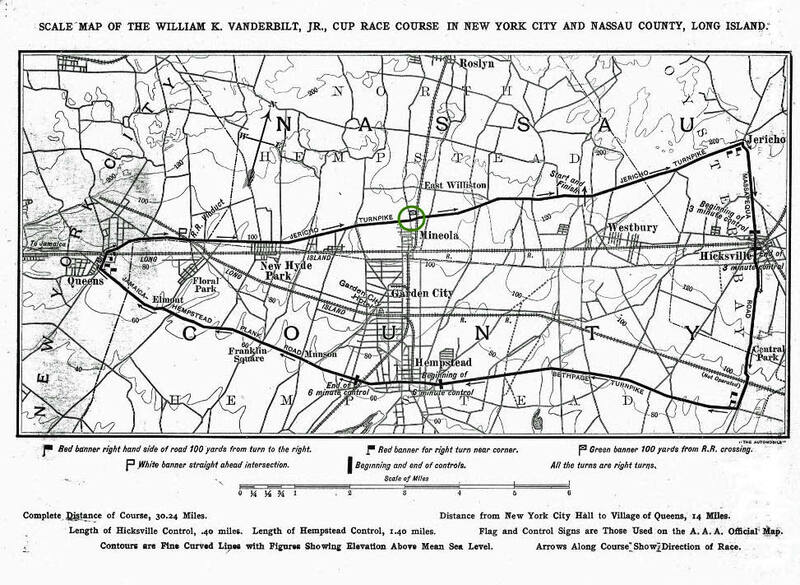 Kudos to Greg O., Steve Lucas, Art Kleiner and Frank Femenias for identifying Krug's Hotel as part of the course for the 1904, 1905 and 1906 Vanderbilt Cup Races. 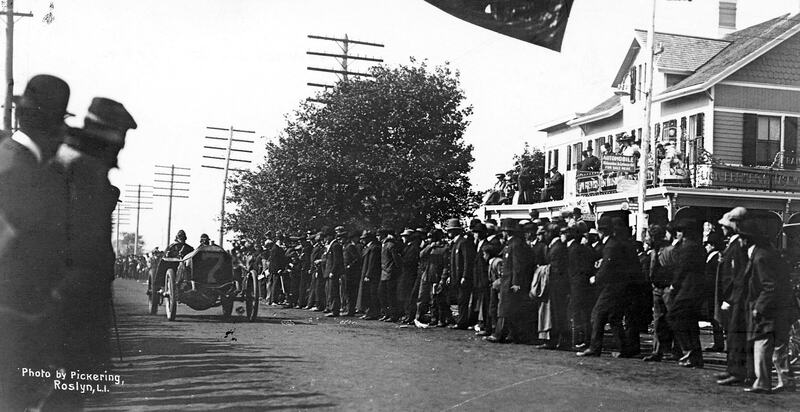 Racers passed Krug's Hotel on Jericho Turnpike going from west to east. 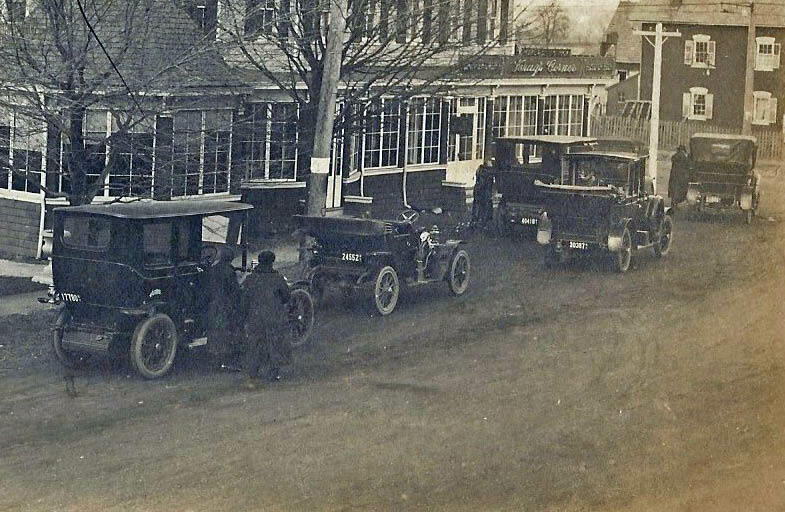 Roslyn photographer William Pickering captured the #7 Locomobile driven by Joe Tracy and Al Poole passing the hotel, looking west down Jericho Turnpike. The 1906 course went south down Willis Avenue and turned east at Krug's Hotel. Maurice Fabry can be seen here making the turn in the #19 Itala. 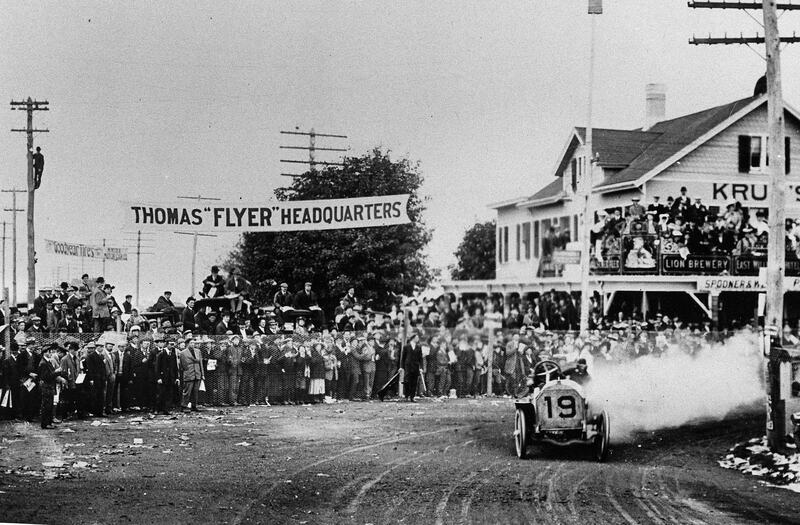 Krug's was also the headquarters for the Thomas Flyer cars competing in the race. The sign says Krug’s Corner, so it is Krug’s Hotel, on the corner of Willis Ave and Jericho Turnpike. Part of the 1905 and 1906 course. I have to admit. From this angle, looking NE, I have not seen this building before. It is a beautiful picture, and a great find. I do not have a basis to even guess the year. Krug’s Hotel at Jericho and Willis Avenue northwest corner. -Identify the building. When was it on the course for the Vanderbilt Cup Races? -What is the orientation of the photo? The cars in the photo on Jericho Tpke are heading in the East direction. The building at 136 Jericho Tpke (that still stands) can be seen along the right edge of the photo. -What is the approximate year of the photo? Provide a rationale. Judging by the 3rd floor addition to Krugs and the license plates, I’ll guess 1910. Didn’t come up with much on this one but also didn’t have the time to look ‘em up…we’ll have to leave it to Ariejan Bos to make some positive vehicular identifications! That’s the famous Krug’s Hotel located on the northwest corner of Willis Avenue and Jericho Tpke in Mineola whose occupants had a front row seat for the 1904, 1905, and 1906 Vanderbilt Cup Races. The photographer’s camera was pointed northeast with the cars facing east on Jericho Tpke. Based on the design of the license plates on the cars, the photo was taken in 1910, 1911, or 1912. If the photo was in color, we would know for sure based on the background color of the plate. Since 1910 had a dark blue color, I’ll guess that year. I’ll leave the identification of the cars to the real experts because I have no clue. Identify the building. 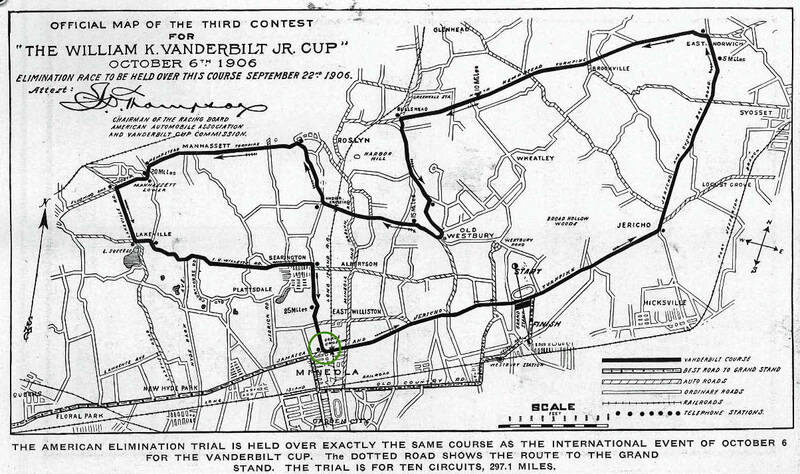 When was it on the course for the Vanderbilt Cup Races? What is the approximate year of the photo? Provide a rationale. 1910-1913 License plate format (12345, no dashes) and white on dark background might be the clue. That appears to be the Krug’s Corner Hotel, looking north and east. Since it has the mansard roof installed it’s definitely after the 1910 Vanderbilt race. I will guess the early 20’s as I see the highest NY plate is in the 30,000 range. Other photos from the 20’s seem to show awnings on the upper windows which may have eventually been necessary for comfort of the guests. There also appears to be a massive amount of electric lines on the one pole, which shows progress. So perhaps 1923. As for the cars…...I have enough trouble figuring them out looking at the front of them so I will leave that to others. Famous Krug’s Corner! But an unfamiliar, later 1920s streamline design. We’re looking NE with cars parked on Jericho Tpke. The right corner is Willis Av. 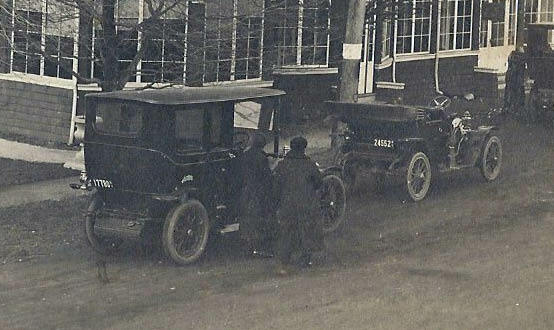 The parked cars could give a closer photo date but all seem older than 1920s (the correct answer will be interesting). The building on top right still stands today (136 Jericho Tpke), complete with window shutters here! This building today was likely moved several feet east on Jericho to make room for eventual expansion of Willis Av, as once noted by Al Velocci. For me it was 136 Jericho that first gave this mystery away. Howard, sending multiple views of this well photographed corner. Taken in 1912 the plates are NY 1912 the only year the year is not on the plate just a NY on right side with white numbers on a vermilion back ground. Only year NY used a porcelain plate. Checked plate on my car to make sure. Cars look a year or so older but rear shots very hard to identify. Does anybody know what year Krug’s stood until ? And what was the reason it closed ? I recall an old Newsday article that showed a photo of the building in 1960s and indicated its use as a fruit store. 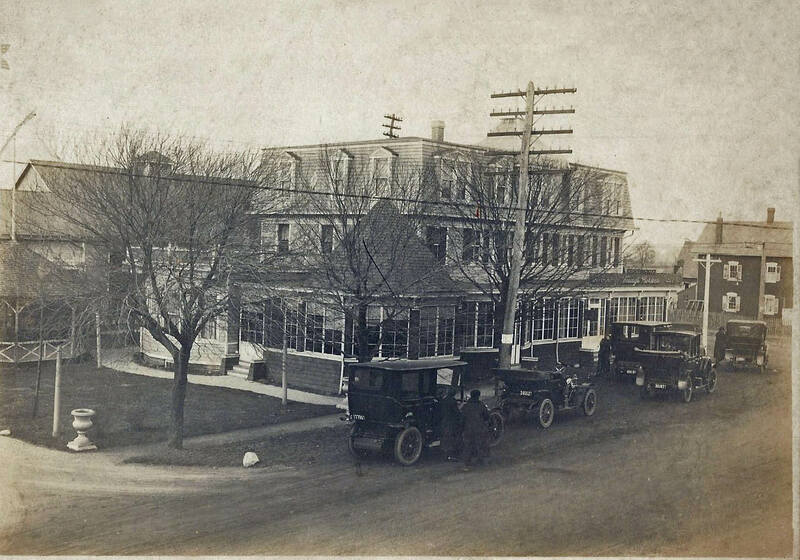 Mineola, LI - “Krug’s hotel on the Jericho Turnpike, near here, famous in the days of the Vanderbilt Cup rces in 1904, 1905 and 1908, closed last night. Its closing was marked by a dinner and “old-timers night,” given to more than a score of old habitues, by Frank (“Father”) Krug, for thirty years proprietor of the place. Mr. Krug has decided to retire from business and has sold the old hotel. Great photo! I’ll bet the car owners loved putting those new license plates on their chariots! They officially owned the newest things,,,,, an automobile!